ISPO Shanghai - the platform for innovation, marketing, networking, and communication - will once again convince visitors with an intelligent hall concept. From July 5 to 7, 2019 visitors and exhibitors will find in the Shanghai New International Expo Centre (SNIEC) four exciting segments. 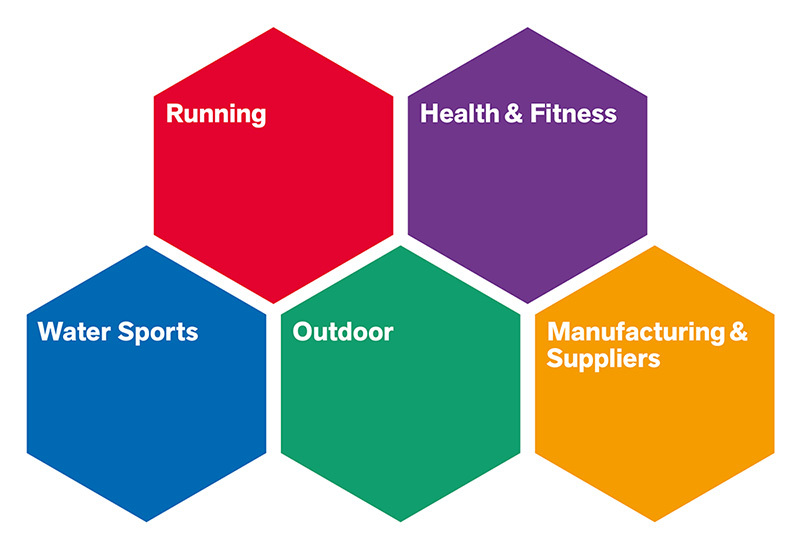 Every segment in this concept represents an overall sports topic: Running, Health & Fitness, Water Sports, and Outdoor. In a fifth section manufacturers and suppliers have their space to present for example the newest trends in fibers & insulation or to showcase seamless technology. The innovative structure helps Asian sports business professionals to build valuable connections around their topics and to let them easily find the products and services they are interested in. That is time-saving and helps to get a fast and comprehensive market overview. The segments of ISPO Shanghai with their associated colors.